AMMONNEWS - The Jordanian leader of the hardliner Salafi Jihadi current said that democracy in its concept as "ruling of the people by the people" is in contradiction with Islam's concept of the sovereignty of God's law. Abd Shahadeh, known as Abu Muhammad al-Tahawi said in statements to Ammon News that democracy in its common conception is forbidden in Islam, where sovereignty and ruling belongs to God's law and not people's authority. Al-Tahawi considered the upcoming Jordanian parliamentary elections, slated to be held on January 23rd, as forbidden and contradictory to Islamic Shariah, because "the parliament legislates laws and regulations that contradict God's law," according to his expression. 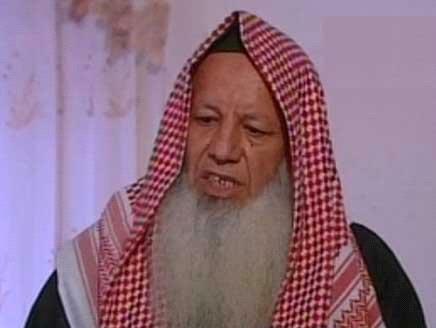 The overall leader of the Salafi Jihadi current in Jordan criticized the electoral platforms presented by candidates and national lists, considering that the election slogans used by candidates are "impossible to implement in reality." Al-Tahawi called for boycotting the upcoming elections, stressing that participation in the elections is forbidden by religion and in contradiction for Islam because "choosing legislators other than God is forbidden," he told Ammon News. "The results of the parliamentary elections are known ahead of time regardless of what the government claims of integrity and transparency of the electoral process," he said, adding that "the upcoming members of parliament are from within the state's composition and do not have any relations with the people or people's rights." That's because Islam is basically a tyranny of old men. '"ruling of the people by the people" is in contradiction with Islam's concept of the sovereignty of God's law'Well then - he'd be best off not telling people how to live God's law, since he *is* a person and not God, eh? And look at the results of relying on gods laws. Infighting, backwardness, mysoginy.. Democracy any day for me. If we extrapolate these basic Islamic ideas to America, then CAIR represents a group totally opposed to America's ideals! I think it was Lincoln who said something about a "...government of the people, by the people, and for the people". Therefore by definition, believing Muslims should not aspire to become American citizens! DID GOD EVER SENDS ANGLES TO RULE ON EARTH,HE HIMSELF SAYS IN QURAN HUMANS ARE HIS BEST CREATION HE EVER CREATED ,AND AMOUNG US HE CHOOSED HIS BELOVED PROPHETS THIS MEANS HE HIMSELF APPLIED DEMOCRACY...SO GOD ITSELF IS BY THE PEOPLE,OF THE PEOPLE AND FOR THE PEAPLE.. Contrary to the rigid interpretation of the Islamic value system which sees this value system as closed, absolute and final, the more common and objective interpretation of Islam believes that this system contains both a constant component and a variable component. Under this robust and flexible version, Islam easily assimilates democracy (some would say Shoura) not only as a tool for enforcing accontability, taming power, and resolving conflict of openions, but also a valuable and practical instrument for seeking objective ethical knowledge (not just subjective preferences) and open-ended searching for the "common good" for the society as a whole, taking into account the "constant component" and its general aims (called Maqased). This man is entitled to his opinion, despite the fact that he is a throwback, lacks any signs of intellect, scary and does not to know what the hell he is talking about. I think that the literature on the link between "Islam" and "democracy" is large, diverse and more important and complex to be objectively covered by a small Fatwa. Generally speaking, there are two contrasting views. Unlike the strict view which perceives Islamic Value System (IVS) as complete, final and absolute, the more common and -in my opinion- more objective interpretation of "Islam" understands IVS differently. According to this robust and more flexible interpretation, IVS incorporates two components: a "constant component" and a "variable component". Islam can easily assimilates "democracy" (some would insist on the word Shoura) within the large "variable component" as a tool to enhance accountability, taming power, resolving conflicting views on complex public policy issues, as well as correcting catastrophic public policy errors. Furthermore, "Islamic democracy" is a valuable instrument to seek objective "moral knowledge" and "common good" for the society as a whole, not just a method to satisfy subjective preferences and maybe business interests. The quest for "The Common Good" (sometimes called Substantial Democracy) within the IVS variable component is an open-ended process and no single party owns absolute and lasting wisdom. Fallibility is the golden rule here, but "majority rule" is also considered necessary to avoid painful policy paralysis. For more information see, for example: Liberal Islam- A Source Book, edited by Charles Kurzman (Oxford University Press, 1998). Thank you, may Allah reward you abundantly.